It was only in Caliraya, Laguna where we had a chance to ride together. But prior to that I’ve seen Nerica Joy’s posts online about her adventures with her brompton. Though ive heard of people using the bike on long distance trips, very few would do such in the Philippines. And Nerica is one of those few who’d take that long distance adventure using this 16 inch wonder. For this entry on featured builds, Nerica took time to talk about her bike. PV: Interesting to see that brompton riders like you go long distance with this bike. Does your bike have a name? NJ: I call my bike “Tanke” because it’s as heavy as a tank hehe. PV: Quite interesting name! and i agree with you that the bike is a bit on the heavy side given its steel construction. what’s the story behind it? Why decided to have that build? NJ: The primary reason I got the my Brompton is because I bike to work. Since my work is client-based, I need a bike with a compact fold and easy manueverability for urban commuting. But since I love to do long rides as well, why the heck not use the Brompton? PV: I agree about the compact fold and its potential for long rides…i remember the topic of type of bike is a longstanding issue among long distance riders but it’s nice that you always go for personal preference and balance opinions of others with your own needs. so what’s in it? anything special? NJ: Its sturmey archer rear hub makes it easier to shift gears when tackling steep climbs. Also, its geometry allows me to pedal in a near upright position so I won’t tire easily after long distances. Plus, it is very easy to upgrade the brompton to attach racks and bags. The only fault that I have with my build is that it does not have dual crank (yet). Its current build is best for flat pavements. But that doesn’t mean I don’t use it to climb hehe. PV: yeah tell me about climbs! you basically strolled through the Caliraya climb without breaking a sweat! since you’ve been doing long distance trips for quite some time, what’s the most difficult ride for you? NJ: My most difficult ride would be hands-down the Taal Loop via Sungay, Talisay Batangas. After 150 km, we were supposed to climb the dreaded Sungay road going to Tagaytay. I was already exhausted then. This is the time when I wished I didn’t use my Brompton because my build has a 50t crank with 16″ wheels. It was not made for climbing. After just 1km mark from the bottom of Sungay road, both my legs cramped and I could not recover. If only I had a smaller crank, the climb would be easier. I vowed to return with a vengeance hehehe. PV: Everybody dreads that Sungay climb but im glad you got through it…and hey, it’s just there waiting for your revenge hehe…considering that the Brompton may be a difficult bike to bring if you have a lot of climbs in your route, what would be the most memorable ride for you? 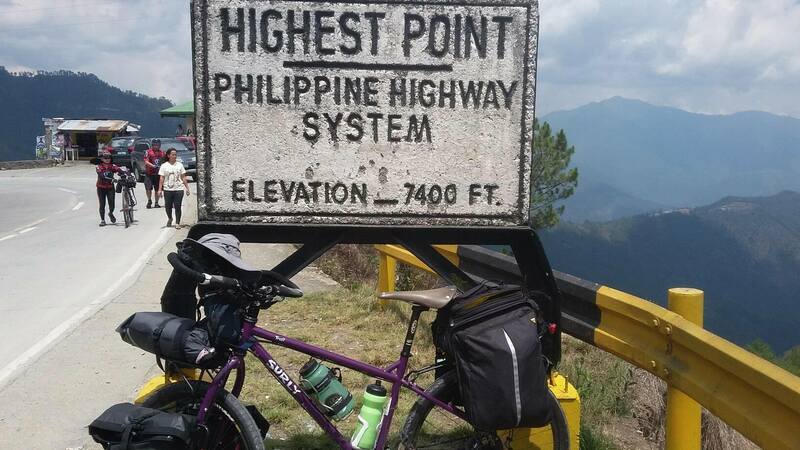 NJ: My most memorable ride would be my attempt to bike from Manila to Sagada. My favorite part was Kennon Road. The view was so breathtakingly beautiful that I did not feel the heat or the distance of pedaling for 5 hours to the Lion’s Head. Unfortunately, I did not make it to Sagada by bike since I had an accident. But still, the journey more than made up for the inconvenience that happened. PV: Ah yes, i remember that when i saw some of the photos online but im glad that you made a speedy recovery and that didn’t dampen your spirit! Why is this build for you? NJ: I am more of an urban commuter than a tourer that’s why the B is perfect for me. But don’t let the small wheels fool you. It can keep pace with roadbikes on flat pavement and easy shifting makes it a contender on the hills. It’s great for touring as well as for urban commute. PV: totally agree on this one. I think on my stable, the Brompton is the best commuter out there given the terrible traffic in Manila! and to end, what advice can you give those interested in bike touring? NJ: My advice to anyone who is touring is to just do it (Nike? Hahaha). The adventure begins the moment you walk out the door. You’ll know what you will need the next time. I’ve heard of countless stories of how good Samaritans-total strangers-have offered whatever it is needed by the biker. Whether it be food and drink, shelter, mechanical assistance or even company, these Good Samaritans are a beacon of hope for riders heading towards great distances isolated from family and friends for many days. As time passed by, doing several multiday tours, good Samaritans have always been a part of the success of our trips…offering their space to rest during intense heat or rain, offering cold drinks or coffee,a hot meal, or even a place to stay for the night. This holiday season, we are reminded of the good Samaritan for two things. Unlike the regular tourist, these good Samaritans are never part of the tourist spectacle. That is, they are never obligated to help or assist or even entertain the tourist-they are regular people who are part of the place we visit. And for that, the cyclist will always be fortunate-to have a much more enriched experience with these people. Often times, these good Samaritans give beyond what they possess-time, resources, effort. More importantly, as cyclists who travel great distances, we live from what we get (and our success can be greatly attributed to their help), but these good Samaritans live a life from what they give. They’re dangerous, difficult to use, and for some, it’s viewed as reckless cycling. Don’t get me wrong though- I respect Fixed riders because we share the same passion as some of us have-But riding Fixed isn’t really for me. Anton is one of them. Meeting him before in a long distance ride at the Sierra Madre Route in Rizal, I found him quite odd that he used single speed. But when I joined the group that he was part of (Surly FFFinas) I was even more surprised he had different bikes that are set up in unique ways but all shared a common characteristic-either fixed or single speed, and fat. Anton is obviously one of those strong riders out there but very professional. Don’t let the beard strike fear in you! He’s one of the most humble and kindest out there and his knowledge and skill with the bike will obviously make you believe that anything is possible. PV: So what’s the story behind the bike? A: this i got second hand.. Not my idea- wish it was.. Tristan (a friend) built this frankenstein!! The only thing i did was give it life..
PV: hmmmm, I’m curious since we both ride Surlys it appears to me that the Fat Fixie isn’t one, so what is it? A: It’s a Scott Boulder mtb size 24 steel frame converted into a fixed gear. The rear end was ‘katay’ (cut up and reassembled) by a local frame builder Mr. Avelino Maldea (the legendary Filipino framebuilder) to fit those 3.0 tires on 50mm rims on the rear & 85mm rims up front.. Placed a bmx handlebar to make it like a bmx i used to ride when i was a kid. Fixed, fat and BMX handlebar! PV: Wow, I’ve recently had an interest in Single Speed and would like to setup my own ride with those cool BMX bars- a tribute to that reckless youth in me, but what’s strikes me curious is why ride fixed? PV: I see, I even rode with you at Reverse Palace in the Sky down South, Magnetic Hill +Sungay and Another Sierra Madre ride at the East (all at least 120km) and you used this with relative ease…so tell, me what’s the most difficult ride you’ve had then? A: . I don’t have one in mind, But i have a difficult time waking up early for rides. Basically that’s the hard part. PV: hahahahaha! Well, it’s a testament to your skill and strength that I think any ride is a welcome challenge for you. To end, What advice can you give tourers? A: For me getting a good bike fit is a must.. Spending hours on a wrong fitted bike is the last thing you want & hydrate 3 days before a tour/long ride. Bow! I believe that any bike can be converted into a touring bike and from time to time, I’ll be featuring several builds from friends and hopefully, we get to pick up insights for our own dream build for our epic adventures. PV: So, does your bike have a name and what’s the story behind it? DF: I named him Lando because that was the maiden voyage of the bike and during our trip (Manila to Aparri), that was the time when typhoon Lando hit the country and that was one challenging ride that we eventually had to abort due to bad weather conditions. PV: I see, so why use a folding bike for your tours? And why bike Friday? PV: Interesting, I agree that steel definitely has its charm when it comes to touring bikes but I gotta ask, what’s in that yellow bike Friday of yours? PV: Lando is definitely a keeper with these specs-I’ve always wanted those Hope Mono hubs and we’ve always argued about the brooks saddle since I’m a C17 fan hahaha…what about the most difficult ride? PV: Clearly remember that especially day 2, aside from extreme weather, the rolling terrain was just terrible! What about your most memorable trip with Lando? PV: Wow, ive never done a lengthy tour abroad and that must have been really memorable for you…since readers may want to get ideas for their project touring bikes, I have to ask, why is this build for you? Looking at his rig, you can really sense a minimalist build while keeping the essential components for his riding needs. Perhaps owing it to his mountaineering roots, his rig observes that pack light philosophy which appeals to many riders out there.